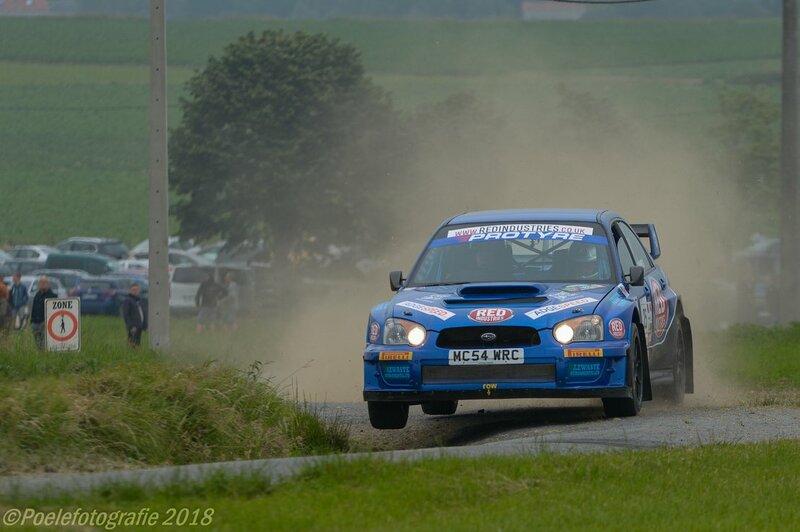 With only 4 weeks until the 3rd round of the 2018 Protyre MSA National Asphalt Rally Championship rally the Rally van Wervick in Belgium, it was a big job to get the car repaired in time and with having to leave on the thursday the car was only just finished in time, but everything seemed to be OK.
Never having been to Belgium before the team of Adrian Spencer and Matt Daniels in the RED Industries, Adgespeed, ABR Engineering backed Subaru Impreza WRC S11 were looking forward to the challenge and hoping to get their championship back on track after the Manx disappointment as with 5 rounds to count out of 6, a finish is what was needed. Seeded at 25 and with a lot of top crews entered and with several BRC drivers, Rhys Yates and David Bogie registering for the MSA championship as practise for the up coming Ypres rally. Also entered were Championship leader Jason Pritchard bringing out his Fiesta S2000 as the Focus WRC was having some work done and multiple Championship winner Damien Cole in his Fiesta WRC, it was a very strong entry with 13 R5 cars, 6 WRC and some very quick local drivers. 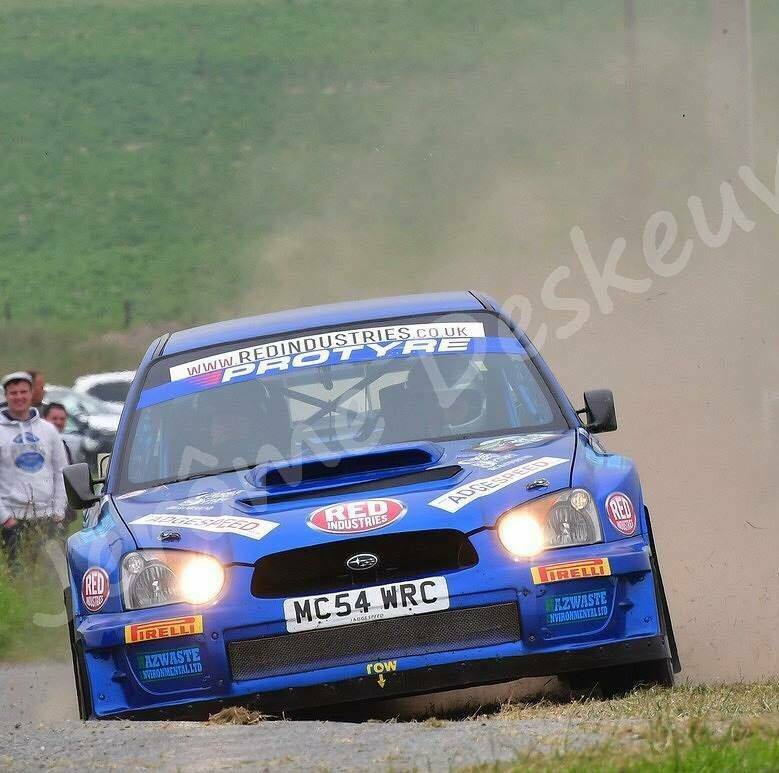 The rally consisted of 4 loops of 3 stages and was based in the town of Wervik and with the stages being near, the recce was done in quick time. The stages consisted of 96% tarmac with some gravel but the biggest difference was the cuts required to keep the speed up, compared to the usual rallies where cuts are to a minimum and with a lot of ditches to catch you out it was going to be fun. The service area was in the town centre and with the weather being quite warm it brought the crowds out which makes a change from the usual middle of nowhere Epynt and Otterburn events. And so they set off for the 1st loop of 3 stages. The 1st was a shortish 3 miler to ease you in and with a steady run the stage was completed. On to stage 2 which was only a couple of km's away a 6 miler, this was going well until an overshoot at a square left dropped some time. but no other dramas. Stage 3 the last of the loop was different to say the least as it consisted on 2 laps giving about 6 miles, but 10 yards from the start was a crossroads at which you went straight on from the start, but then the stage brought you back to the same point at which you turned right to start the 2nd loop, but to finish you went straight across the junction. So you're sat on the startline when a car comes flying across the junction just before you start, lets hope they know what they are doing as I don't think they would allow it in the UK, but it worked very well with no aborted starts due to cars flying across in front of you. With the 1st loop completed it was back to the service area and then to a regroup area before going over the start ramp again before heading out for the 2nd loop. With the overshoot Adrian and Matt ended up 39th O/A and 8th MSA. Rhys Yates in his Skoda R5 stunned the locals by taking the lead overall with David Bogie 6th. 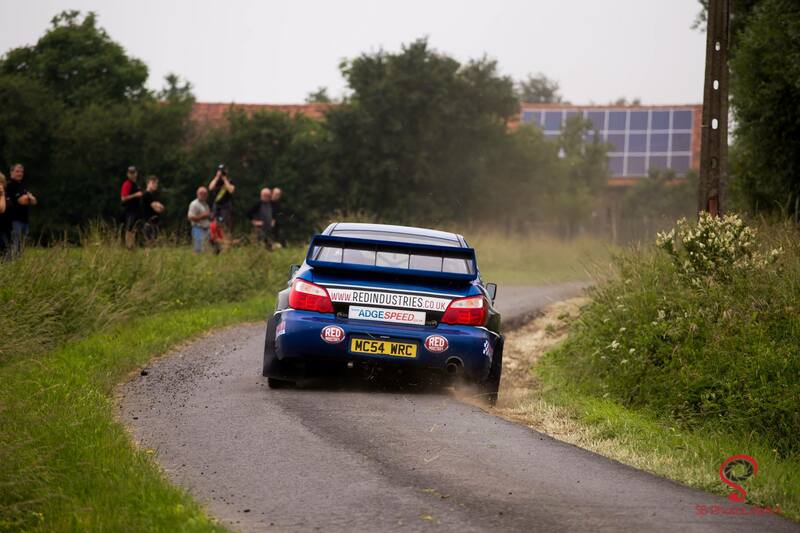 Daniel Harper in his Mini WRC was in a big battle with Wayne Sisson and Barry Groundwater in their EVO X's. However the end of the 1st loop saw the retirement of Damien Cole with engine issues. Out for the 2nd loop and with no dramas except for the anti lag not working leaving the boys down on power a clean run resulted moving them up to 27th O/A. At this stage Rhys Yates was still in the lead of the rally with David Bogie 7th and a with big battle for 3rd as Pritchard, Groundwater, Sisson and Harper were 12th, 13th, 14th and 15th respectively. Adrian and Matt had moved up to 27th O/A. For the next loop of the stages and with the weather staying nice and dry, the pace was good for Adrian and Matt until Adrian got caught out on a left into right with big cuts ending up driving along a ditch and being unable to get out they were forced to stop. Thinking it was the rally was over and annoyed at being caught out, when all of a sudden around 20 people arrived, hooked on a tow rope and pulled the car out of the ditch with some help from the 4 wheel drive and off they went losing just over a minute. Having seen the incar video and all the clips on Youtube ( https://www.youtube.com/watch?v=9_qMuQwuw3Y ) it seems like there was a couple of thousand spectators at the spot, so big thanks to them for their help. Back in service and with the team expecting some damage, all that could be found was a scratch on the wing, a very lucky escape and back in the rally. The indiscretion dropped them down to 33rd, but the loop saw the retirement of Pritchard with clutch issues whilst Yates maintained his lead at the top. That meant that Bogie moved up to 6th and Harper was in front of Groundwater and Sisson who were seperated by only 10 seconds in 12th, 13th and 14th. So it was off for the final loop and it was time for a steady run and no mistakes as 5th in the championship was too far ahead and Ed Fossey 7th was a further 10 places behind O/A. And so thats how it was with Adrian and Matt moving back up to finish 27th O/A and 6th Championship contender. At the front Yates took the win O/A and 1st Championship contender, David Bogie held on to 2nd with Daniel Harper winning the closely fought battle for 3rd with Barry Groundwater 4th and Wayne Sisson 5th. All in all a good rally and a good challenge to do something different. Hopefully now with the recent closed road legislation, we will now be able to have rallies like this being more accessible to the public. Also the format is much better as it is in Ireland by having 3 or 4 stages repeated 3 times, the event is set up for the day with no issues moving marshall's, safety management etc around to different locations. The result now moves Adrian and Matt into 5th O/A in the 2018 Protyre MSA National Asphalt Rally Championship. The team are now sorting the car to get it back to full power for the next round The Carryduff Down Rally in Northern Ireland in mid July another 1st time event for the crew.